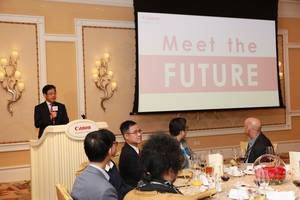 HONG KONG, March 22, 2019 /PRNewswire/ -- Canon Hongkong Company Limited (Macau Branch) (CMAC), celebrated its 10th anniversary with a special "Meet the Future" event at Wynn Macau, where the company unveiled Canon's vision for the future of imaging technology and its role in helping Macau achieve its goals under the "one centre, one platform" strategy. Officiating the event were Mr. Shunichi Morinaga, President & CEO of Canon Hongkong, and Mr. Philip Chan, Director and General Manager of Business Imaging Solution & Production Printing Group, Canon Hongkong, who also expressed their gratitude to the honorable guests, dealers and business partners in attendance. Emphasizing his confidence in the Macau market, Mr. Morinaga said, "Canon will continue to pursue innovation in longstanding business segments such as cameras, inkjet printers and multifunctional devices, focusing on four new businesses: commercial printing, network cameras, healthcare and industrial equipment." The Macau SAR Government's "one centre, one platform" strategy -- which calls for the dual transformation of Macau into a global tourism centre as well as a commercial and trade platform between China and Portuguese-speaking countries -- demonstrates the importance of information-sharing in today's world, one in which images are playing an increasingly important role. Canon Optical Technology, for example, is being widely applied not only in cameras that are designed for daily use, but also in broadcasting lenses for TV stations around the world. While the Cinema EOS System combines 4K image quality and Canon Color Science, future technology will feature even sharper 8K resolution, revealing the smallest details through exceptionally high-quality images and enabling more production freedom than ever. Mr. Morinaga said, "For the past 10 years, Canon has participated in the growth of this vibrant city through its distinctive imaging technology. By integrating our propriety imaging technology with the latest IT technology, and following our unique definition of IoT -- 'Imaging of Things' -- CMAC is poised to serve Macau with innovative products and solutions well into the future." The "Imaging of Things" approach is embedded in Canon's product designs to enhance connectivity between the physical and virtual worlds. Through the company's imaging technologies, from scanning and capturing to processing and output, it aims to strengthen bonds between people and objects and increase interaction. Such a transformative journey involves a huge amount of digitalization to reshape every aspect of a business. Mr. Chan said, "While we expect enterprises the Greater Bay Area (GBA) can transform at a gradual pace overall, we will accelerate this process with our professionals for enhanced business mobility and efficiency. The ultimate goal is to elevate the customer experience by aligning with the government's 'one centre, one platform' initiative and helping corporations -- especially the hospitality and tourism industries -- achieve digital transformation." He added that by applying advanced technologies such as artificial intelligence and robotic process automation (RPA), businesses will be able to focus more on critical decision-making and better prepare for future expension. Hospitality and tourism, the cornerstones of the Macanese economy, are two industries that stand to benefit from integrating intelligent solutions for higher levels of optimization and standardization. Canon pointed to the example of a major multinational hotel management group that successfully boosted its efficiency through UBP *Antelope*, which acts as a single platform connecting various systems, synchronizing data from different departments and coordinating workflows across branches. As a result, the company was able to reduce its human resource costs by 70% and additional delivery service costs by 80%, while the average time it spent on managing documents decreased from 20 manpower days to just eight. Another UBP solution, the mobile business platform *MobileWork 3.0*, allows data from multiple sources to be consolidated into a single database so that staff can collaborate and communicate across locations and departments via the platform. Colleagues can connects mobile devices with the platform to execute multiple tasks, such as human resources, workflow and document management, anytime and anywhere. Besides, important activities can be monitored via the platform's *My Task* feature, which enables multiple tasks to be assigned to particular staff and makes it simplier for project managers to keep track of working status and progress at once. With MobileWork 3.0, all tasks can be ensured to be completed on time, leading to optimized business operations and stronger cross-border management. The MobileWork 3.0 platform is also directly connected to Canon multifunctional device (MFD) *imageRUNNER ADVANCE GEN 3 III Edition *user interface which automatically uploads scanned documents to the platform and initiates digital workflow for further handling by relevant departments. The integration of MobileWork 3.0 with Robotic Process Automation (RPA) results in the elimination of manual operations for tedious, repetitive tasks, helping documents reach departments instantly and reducing work completion lead times through digitalized workflow, better business mobility and enhanced cross-departmental collaboration. Data security is another chief area of Canon's focus that can never be neglected. For businesses to take advantage of cross-border collaboration, their data protection standards must adhere to stringent international guidelines. Canon's advanced technology offers comprehensive security and ensures that corporate data is well protected. Its Antelope platform also allows users to customize access for individual staff members and provides audit log analysis for accurate document tracking. Canon's MFDs verify systems at the device startup stage. The identification of any unauthorized program keeps the MFD from powering on, eliminating the risk of malicious hacking. In addition, MFD syslog information is synchronized with Security Information and Event Management (SIEM) solutions, providing administrators with real-time alerts about abnormal activities. With improved device usage transparency, enterprises can design defensive strategies and ensure a high level of security. Another feature of Canon UBPs, *Capture +*, further enhances the MFD user experience. The automated data capturing technology of this cloud-based feature helps with time-consuming administration works. Capture + extracts valuable data from scanned documents via the cloud platform and automatically names the file. By replacing manual operations and minimizing the potential for manual input error, Capture + expedites the entire document management process, enabling human resourcesto focus on decision-making, strategic planning and creative works and enhance business efficiency.Mr. Shunichi Morinaga, President and CEO of Canon Hongkong delivered his opening speech at the Macau 10th Anniversary Luncheon, “Meet The FUTURE – Creating Possibilities in The Greater Bay Area”. Mr. Shunichi Morinaga, President and CEO of Canon Hongkong and Mr. Philip Chan, Director and General Manager of Business Imaging Solution & Production Printing Group, Canon Hongkong, toasted to the guests to celebrate the 10th anniversary of Canon Macau. Mr. Shunichi Morinaga interacted with guests and exchanged opinions about how to best utilize innovative technologies, embracing the future of Greater Bay Area. Canon Inc. (TSE:7751 / NYSE:CAJ) was founded in 1937 in Japan. 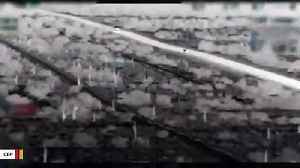 Its predecessor, Precision Optical Instruments Laboratory, produced Japan's first 35 mm focal-plane-shutter camera "Kwanon" in 1934. Canon Inc. eventually expanded into the photocopying and printing industries, launching Japan's first plain-paper copier NP-1100 in 1970 and the world's first inkjet printer BJ-80 in 1985. Through the years, Canon Inc. has acquired in-depth experience in digital imaging product manufacturing, and research and development. It is a leader in the development of innovative products and holds the most technology patents in the imaging industry. Canon Inc. also makes a significant contribution to the promotion of photography. Today, Canon Inc. has a strong global presence and is one of the most important market players in the imaging, office and industrial product categories. As of 31 December 2018, Canon's global revenue was US$35.6 billion. One of the company's first offices in Asia, Canon Hongkong Co., Ltd. (CHK) was established in 1971. It is responsible for the sales, marketing and after-sales services for all Canon product lines in Hong Kong and Macau. With the solely owned subsidiary Canon Business Solutions (Guangdong) Co., Ltd." established in 2018, the company can also provide intelligent total business solutions and professional services to companies in the Greater Bay Area. CHK adheres to Canon's corporate philosophy of "kyosei", which encourages the company and its staff to participate in social, charitable and environmental activities in the community. CHK implements internationally-recognized management systems and has achieved ISO 9001, ISO 14001, ISO 27001 (Canon Digital Production Center) and OHSAS 18001 certification. For more information about Canon Hongkong, please visit our website: https://hk.canon/.